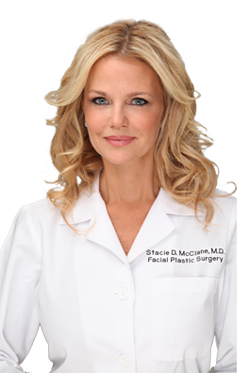 About Dr Stacie Mcclane - Chicago Plastic Surgery Center, LLC | Stacie D. McClane, M.D. Dr. Stacie McClane is a board certified surgeon specializing in Facial Plastic and Reconstructive Surgery. She has extensive training in cosmetic and reconstructive facial procedures. Dr. McClane's patients find her caring, straightforward, and compassionate. She spends time with her patients with consultation and video imaging to truly understand their goals. Please read some of our patient testimonials in the "Patient Testimonial Section." Her philosophy is simple. She provides outstanding results. The following quote captures her spirit. "I want to create a natural look, to rejuvenate my patients' appearance, restoring their youthful image, and making them look as alive and active as they feel." The following is Dr. McClane's curriculum vitae (resume). Please review this to learn more about her extensive training, honors, and publications. RESEARCH: McClane, Stacie, M.D. ; Mangat, Devinder, M.D. ; Yunker, Martha, C.R.N.A. The Use of Perioperative Clonidine To Reduce Postoperative Facelift Hematomas. McClane, Stacie, M.D. ; Mangat, Devinder, M. D.
The Efficacy of Perioperative Antihypertensive Medication in Preventing Postoperative Hematoma Formation in Rhytidectomy Patients. Oral Presentation. 8 th International Symposium of Facial Plastic and Reconstructive Surgery, New York , May 2002. McClane, Stacie, M.D. ; Renner, Gregory, M.D. Enhancement of Auricular Composite Graft Survival with Hyperbaric Oxygen Treatment. Oral Presentation. Combined Otolaryngological Spring Meetings, May 2000. Archives of Facial Plastic Surgery , published May 2002. Haro, Julian, M.D. ; McClane, Stacie, M.D. Ganzel, Toni, M.D. ; McClane, Stacie, M.D.